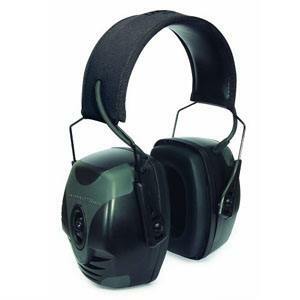 Having the best electronic ear muffs is a necessity for protecting your hearing while shooting. It can be tempting to go with the cheapest option, disposable foam ear plugs. However, not only can they be difficult to insert properly, but they are also uncomfortable to wear and soften all noise indiscriminately. 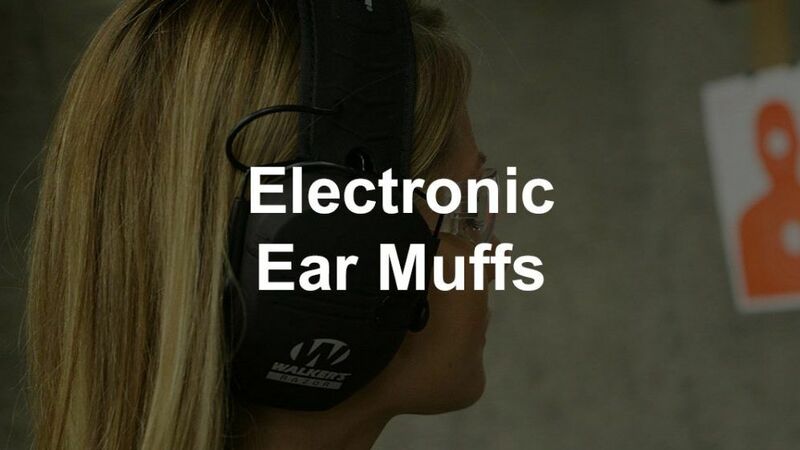 With electronic ear muffs, it's a whole different experience. The most important feature is protecting your hearing. Not only do you get that, but you can also enjoy a great conversation with a friend while sharing a lane at the gun range. 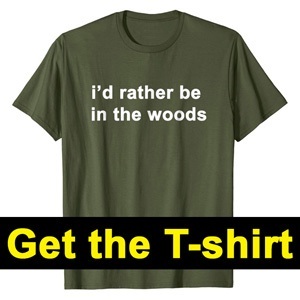 Or you could hear the rustling leaves on a crisp morning hunt. 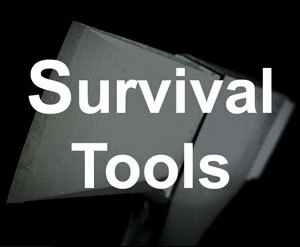 You don't have to sacrifice situational awareness to protect your ears. Once you try out a pair, you will never go back. That's why I did a ton of research to find the best shooting ear protection options out there. In this article, I put together my findings and created a list of the top 10 based on performance and price. With a noise reduction rating (NRR) of 22 decibels (dB), the Howard Leight Impact Sport ear muffs are perfect for outdoor use. Renowned for quality sound, the Impact Sport features an auxiliary input jack, so you can listen to your favorite tunes while you shoot. 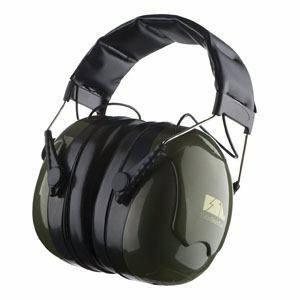 In addition to a one-year manufacturer’s warranty, these ear muffs are water resistant. The removable, replaceable ear cups make these easy to clean and repair! 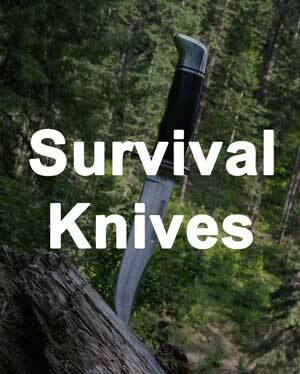 Best of all, the slender profile means they will not get in the way when shooting rifles and shotguns. For those on a budget, these are by far the best ear protection for shooting​. 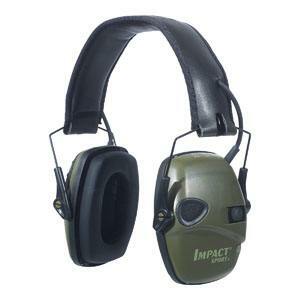 The Howard Leight Impact Pro ear muffs protects your hearing even when firing large caliber firearms indoors. Trading in the slim profile and fold-to-store capabilities of the Impact Sport for a NRR rating of 30 dB, they really perform. Users differ regarding whether or not these get in the way of shooting long-guns. Comfortable for most, a few users with self-proclaimed “big heads” felt like the padded headband pinched with all-day use. These require two AAA batteries, but will still dampen harmful noises even if the batteries die during an outing. If you have the budget, these are the best electronic hearing protection you can get. 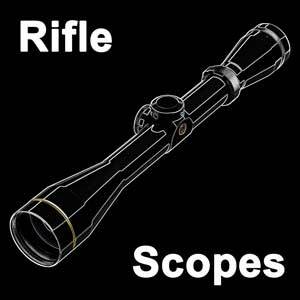 Caldwell Shooting Supplies is a brand of Battenfeld Technologies, Inc. which specializes in hunting accessories. They are actually owned by a familiar name—Smith & Wesson. They do not stick out very far and can be worn comfortably with safety glasses. 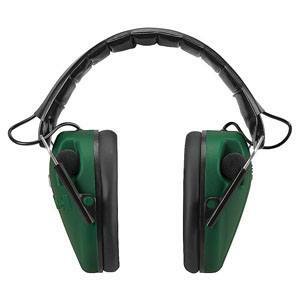 The Caldwell Low Profile E-Max ear muffs feature an auxiliary input jack, padded headband, and a NRR rating of 23 dB. 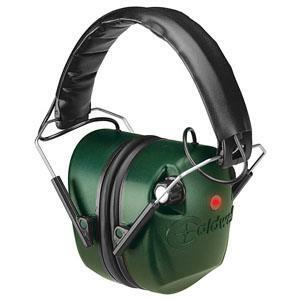 Made of light-weight materials, these budget ear muffs may feel flimsy, but Caldwell backs their product with a one-year manufacturer’s warranty. Users report smooth audio performance. 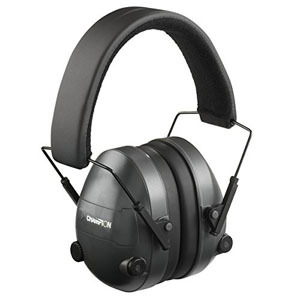 The Champion Pro ear muffs are both comfortable and practical. 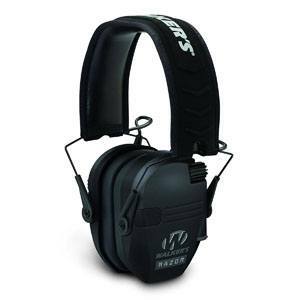 These adjustable ear muffs have a NRR rating of 25 dB and collapse for easy storage. Users either love or hate that they have separate switches controlling the power and volume of each individual ear cup (do not forget to turn both sides off). Mediocre microphone and speaker quality cause some buzzing, but you cannot beat the price. This model comes in black and pink, weighs under a pound, and requires 4 AAA batteries (2 for each ear cup). Year after year, Peltor delivers quality hearing protection for all budgets. With a wide padded headband, the 3M Peltor Sport Tactical ear muffs provide a comfortable fit for shooters big and small. 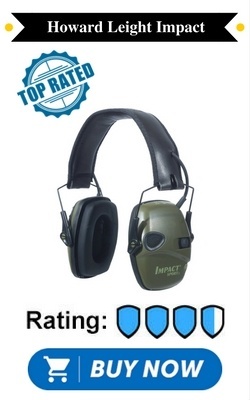 They offer superior noise protection and carry a NRR rating of 22 dB, but users feel they are better at dampening sounds than electronic ear muffs with higher NRR ratings! The purchase includes an auxiliary cable that gives surprisingly good sound reproduction. The power turns off automatically to conserve battery life after two hours. 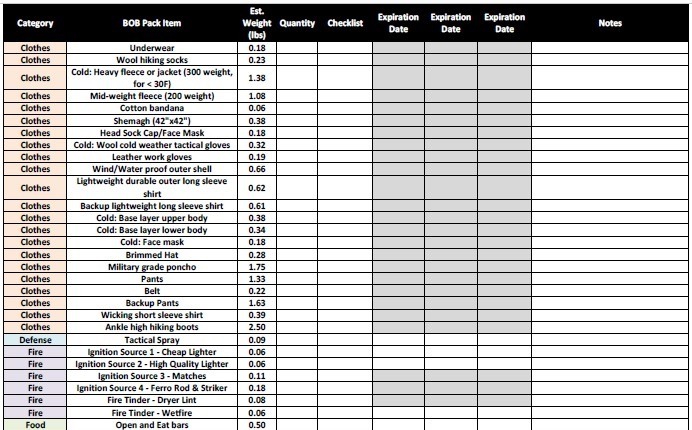 Beware—these are not waterproof. 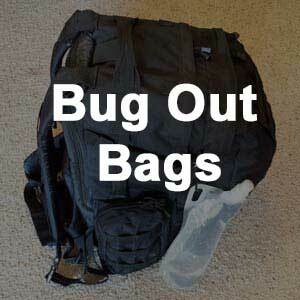 Toss them in your range bag and go! 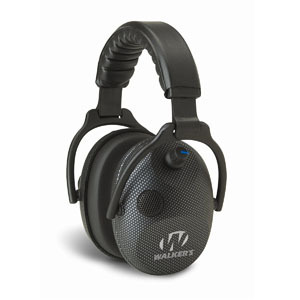 The Walker’s Game Ear Razor Slim ear muffs are collapsible, adjustable, and have a NRR rating of 23 dB. The muffs fit tightly (good seal = good protection), but not so tight that they are uncomfortable. They produce impressive stereo sound with minimal buzzing and feature a single knob controlling volume for both ear cups. The faux-leather ear cushions are easy to clean. Bonus points for coming in a variety of colors (pink, teal, black, green, etc.). They are even offered in Kryptek Typhon camouflage. Dampen the noise you do not want to hear (NRR rating of 24 dB) and amplify the noise you want to (up to five times) with Walker’s Game Ear Alpha ear muffs. These have a similar design as the Razor Slim model. They feel sturdy; however, you can purchase replacement headbands and ear pads to fix any parts that may wear out over time. Depending on whom you ask, the individual volume controls for each ear cup can be a pro or a con. 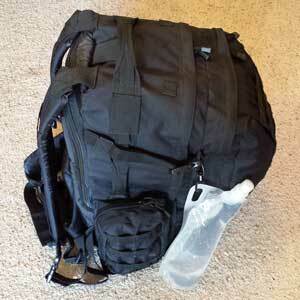 They provide great protection in a relatively compact package! 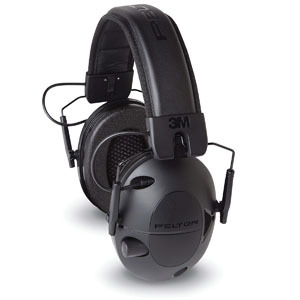 The 3M Peltor Sport RangeGuard ear muffs are resistant to feedback and can hook up to your phone or MP3 player to play music while protecting your hearing (NRR rating of 21 dB). The svelte design and gray/black color scheme is timeless. These do not interfere with the butts of long-guns and are excellent for indoor and outdoor wear. They automatically shut-off to conserve battery life. We absolutely love that the battery door is tethered to the headset so you never have to worry about losing the plate! The Caldwell E-Max model gives more protection than the Caldwell Low Profile E-Max. Users report that it fits big heads comfortably and even fits over a baseball cap! They also feature a big red light to indicate when they are turned on so you will never reach for them only to find the batteries have run out from being left on in your bag. These are a good buy that will not break the bank. You can be sure that this is a quality product. They offer a one-year manufacturer’s warranty. These only come in green. Future Sound Lab’s Patriot ear muffs is the only product on our list by a company whose focus is not outdoor and firearm accessories. They may look bulky, but they weigh less than a pound. Unlike both the Peltor models on our list, the battery door is completely detachable (no tether). 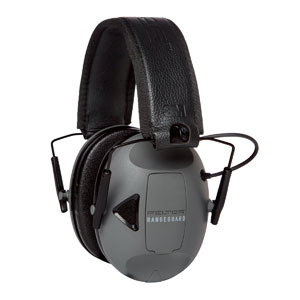 With a NRR rating of 28 dB, these offer great protection for a budget-friendly price. If you are looking for the best sound reproduction, beware that this only has a single microphone. This model takes AA batteries and is only available in black/green.